[Updated] Minister of Public Works Lt/Col David Burch is holding a press briefing this afternoon [Feb 1] to provide an update on waste management. We will have additional coverage later on and in the meantime the live video is below. Update 4.23pm: Minister Burch said, “Good afternoon. It was a year ago yesterday, January 31st, 2018 that I first reported publicly on the challenges we were facing with garbage collection and announced the implementation of once a week collection. “To briefly recap the situation – we had issues with the number of vehicles in service, the abuse workers were being subjected to, the unreliability of pick up, exorbitant overtime, injuries to staff and general dissatisfaction with service levels. 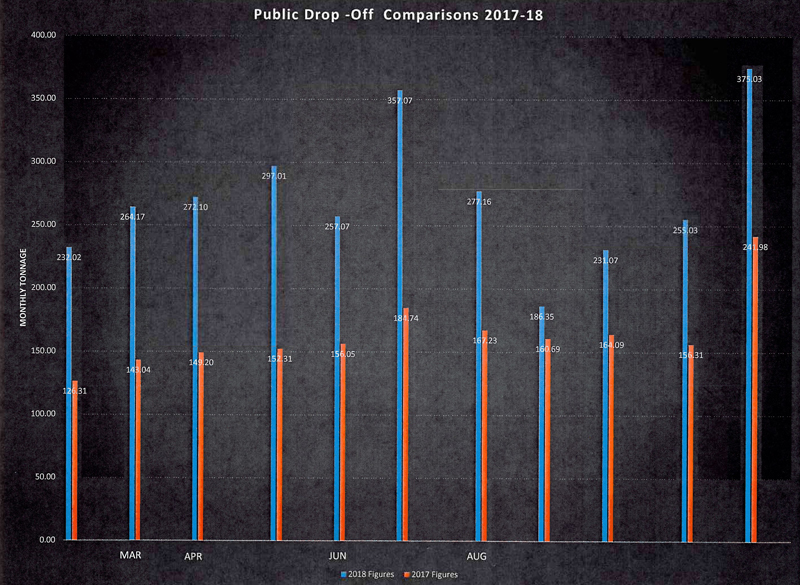 “The opening hours of the public drop off were extended to make use of the facility more convenient and the results are a significant increase in its use [ a graph comparing 2017 to 2018 volumes is below]. “Overtime has been cut by more than half from $1.2M to $320,000. The number of injuries are down significantly, the number of vehicle accidents are also down and the work / life balance of staff has improved since they no longer work into the evening hours. 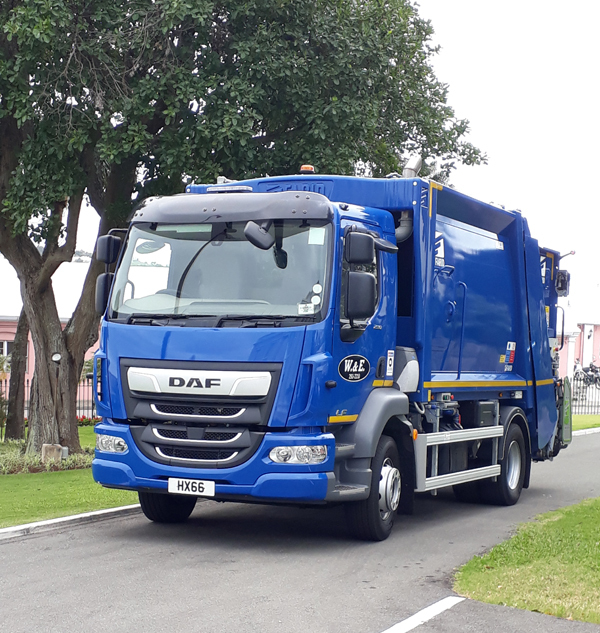 “You may recall that a year ago we sent a team inclusive of a driver and worker overseas to select the next batch of garbage trucks – I am pleased to report that the new trucks arrived on island last month. “The aim always is to rid the country of garbage, manage the expectations of the public by not falsely promising what we cannot deliver. “Let me now set out what additional measures we will take to assist the Bermudian public. A consistent complaint during this period has been from those areas that utilize the very large gray bins in communal disposal areas as we have experienced a severe shortage of the bin lift trucks. “All of us can help in that regard, however, by reducing the incredible amount of waste we generate, recycling and composting food waste. We are experiencing an increase in maggots in the waste – this is mainly due to a combination of food waste and the climate which are the perfect conditions for them to flourish. Some members of the public have suggested lidded trash bins and freezing food waste until the day of collection. “In this vein as well the Ministry has purchased 300 – 95 gallons wheelie bins – scheduled to arrive on island next week – to be followed shortly thereafter by a similar number of 48 gallon recycling bins. These will be sold at landed cost and initially be targeted at those neighbourhoods that use communal collection points to help address the challenges with vermin and feral chickens attacking trash bags. “Let me end where | began – by thanking the public for adapting to this new collection schedule and those workers in waste management who do an outstanding job in collecting our waste under the most trying circumstances. | encourage members of the public to give a thought and even express thanks directly to those workers who so efficiently collect our garbage every week. “There has been general acceptance of the once a week schedule with a small minority of people ignoring the rules. We are determined to address this bad behavior by encouraging our workers to take pictures of any infractions, report it to their manager – so that we can take action. Once a week garbage collection will now(!) be made permanent. What a surprise?!?! If you can’t manage the waste, why does he call it Waste Management? Where are the dam buses u muppet?! De money for de buses went on Americas Cup, idiot. Simply untrue, America’s Cup made money for Bermuda. How about telling the truth for once. Your PLP lies and propaganda are disgusting. Rat population has expanded considerably on the island. Next will come disease, but you are OK with that, and despite buying 5 new trucks we are still only once a week pick up. I would love to see the financial transparency on who made money from this purchase. You are a dumb dumb. The money used to buy the new trucks came from the profit off the Americas Cup. It definitely didn’t come from the Black Mayor’s Conference or Beyonce!!! Ha ha ha!! So what about the new buses that were delivered in Be4muda January 2018. Why aren’t they on the road yet, idiot? It’s because you stupid idiots ordered and bought buses that can’t be used here. Wasting our frikkin money again. You lot can’t be trusted with money. as usual with him he’s talking Garbage! The Minster who doesn’t get things done…. You wish. Try winning the next election before you talk smack or place your hat in the ring if you think you can beat him or any other PLP. Your ubp or oba will have no choice but to change the name after next election or split. The swing voters are not returning……TRUST ME I WAS ONE!! Nice try – but nobody believes you were a swing voter! Whats is you point about winning the election. Trump won in the USA! Look at the leaders of Venezuela , Columbia, Korea and many others that won at the polls! It doesn’t mean that the best team won! It means their many years of brainwashing the people and collaboration with the unions, fake people’s campaign marches and churches was successful. What has the PLP done for the people? Where are the jobs that were promised ? What happened to the Casino commission? Why are there no Casinos YET! Cruise Ship Companies can design, build, decorate, and staff a luxury cruise ship complete with a Casino in under two years! Mr. know it all Simmons got rid of the head and still has not found a suitable replacement. Meanwhile the Gaming Commission has for years paid rent, staff, marketing and for what!? This is the definition of the word incompetent! Stop drinking the purple koolaid my friend and think about your kids future. I believe that man or woman was a swing voter! How do you think the past Governments won in their election? You should listen to them. The black voters that you need to swing have departed and are not returning to the OBA. They alone swing and decide who wins every election. Whites only vote 1 way, so who’s more racist??? The OBA is a failed creation of the past UBP gov changing the name did not work. The new OBA is simply a bounty chocolate………., chocolate on the outside but we all know it’s coconut inside! A third party will be created. Wait and see! Pee El Pee!! Pee El Pee!! Nobody cares!! LMAO!! How are you enjoying more taxes paying for PLP debt and less services. The PLP, doing less with more. Swing voters never returned dummy. U always voted plp anyway lol. Wha u think everyone is dumb? Only reason oba won in the first place is because u didnt vote. So stop it. There is no such thing as a “swing” voter in bermuda. Lets be real. No lets be real dummy 4 REAL. We have a black vote and a white vote. 16 of 20 years and a record of failure and incompetence. You’re right, 16/20 years, $2.5bn in debt and people still struggling. Pee El Pee!! Pee El Pee!!! Bermuda for Bermudians!! Ha ha ha!! We knew this would be the cash when they initially said “temporarily”. I should have made a bet… Hopefully KBB find more volunteers fast because we all know what comes next. Good job Government. Another excellent idea. Burch,…..If the bag is at the curb, chances are it wasn’t filled there! Therefore one man, OR woman OR Child carried it! Here we go again, garbage in = garbage out, reduction in service increase in tax equals efficiency in who’s book?? Cut their work by 50% and increase wages by 3% If the W&E employees were private employees there would be a completely different outcome this “minister “ is far far removed from reality and as usual the people of Bermuda are the ones who have to deal with the consequences of stupid ideas and decisions that are made by “leaders” with very little experience or qualifications for positions that are handed out. Ya we know muppet. Pretty sure thats all u can say cause its all u know. I am hoping trash bins become mandatory like other parts of the world. Yes, all of the same type & size, designed to be picked up by a single man operated trash truck. You put your trash bin in the right place or it does not get emptied. A self loading truck will cost more but it does not need holidays, needs little health care, & does not need to go to any meetings. Yep. It doesn’t need 35 days vacation and 70 days sick leave a year and carry forward sick leave you didn’t use last year. But it does’nt drive itself. I see a pattern here – an announcement and then an easing into the new reality. This once a week garbage collection will certainly be interesting in the heat of the Summer months . . . is this a cost cutting measure? The spending and cost cutting seems to be very controversial and at odds with each other; it seems that the average working person in this country is the one who is taking a beating by the administration in charge. Can we have cameras set up in Ms. Webb’s new office to see what is actually taking place there with well earned tax payer money? I am sure she may need trash collection daily for all the garbage happening over there . . . this is beyond ridiculous ;o) Bermuda wake up and smell the manure! When I once worked in a transportation related industry and the schedule was reduced by 50% in the off season staffing was also reduced by 50%. What will be the savings here ? Oh ,that’s right , none ! The union runs the government so there will no saving at all . Furthermore , will the minster who ‘gets things done’ finally come down on the fly tippers who will surely explode ? Will he come down on people who still act like we’re on a 2 day a week collection schedule putting out their trash on a non existent collection day ? People who after a decade still have not figured out that the trash does not get collected the day after a public holiday ? And the people (slobs) who put their trash out the night (or days ) before the actual collection day so the birds can tear the bags apart and then a gale comes along and scatters their trash all over ? I can live with once a week collection but it’s obvious that way too many can’t and don’t care to adjust and they need to be addressed. “locals and residents alike” – why does this man always have to divide. Because he’s a problem. Plain and simple. If you all have so much mouth sign your Real Names I take my hat off to the gentleman that pick up are Trash and Colonel Burch. Sorry but plp had all the answers pre July 2017 now nothing but bad news for the people of Bda. Take your hat off all you want to whom ever you want. The truth is that the colonel and his/your party are planning to spend money elsewhere and are glad to have soldiers such as yourself that accept this ignorance. P.s. the guys picking up trash are soon going to be paying higher taxes. You take your hat off to reduced services and increased taxes. Why? Like we don’t know. When you look at the amount of money spent on overtime, it makes sense to cut collection days. Every time something is changed by the PLP there is a problem. It just makes sense. Tunes Bay opening for more hours must be discussed. the plp issues free green knee pads for their crawlers,go and get yours. Real names dont make a difference. It just gives you lot someone to target. You think putting your name down solidifies it as truth?! Lmao. You guys make me holler. Ok. My real name is Daniel. And just a little tidbit. The man is not a colonal. He isnt in the military anymore. Pretty sure u need to be capt or major to have that title permanently attached to your name. I have not read, I have not read , of extended hours for Tynes Bay , maybe it was written somewhere in the whole of the news to the public. Can you imagine 5 thousand cars trying to off load trash each day , during restricted hours. Ok…that’s fine…..great savings where is it ? Nonsense…I …for one do not accept that…these lift bins came from? Picking trash less is permanent…your saying then there is a one point seven million savings in revinue.What exactly is this being used for? And yes…it is my business…it is all our business! More so than yours…you don’t pay our taxes…. Somewhat are the drivers doing the off days. I’m sure there’s not 5 days a week of trash pick up. They can always drive the buses. So many complaining on social media…. time for action. Vote no confidence. Make noise. Action needed not all these unheeded words. We ALL need to fight together for a better Bermuda. This is our home. Our children’s future. How we ALL work together? Where is the people’s campaign now???? Dis de pay more get less govt. What exactly are the savings vs twice a week collection? Do the drivers and workers earn any less? Or are they getting the same pay for half the work?